Why are job links not saved? These days I am searching for a new collaboration and I am using SO Jobs to do so. I like the feature very much, but when I open a job listing in a new browser tab and then the next listing in another tab, my first listing is not marked as viewed in the Job list. It would be very useful for me to see which listing did I open. As far as I remember, opened listings were displayed as already opened, with a slightly different color even after reload. Is there a reason to not show the already opened links? 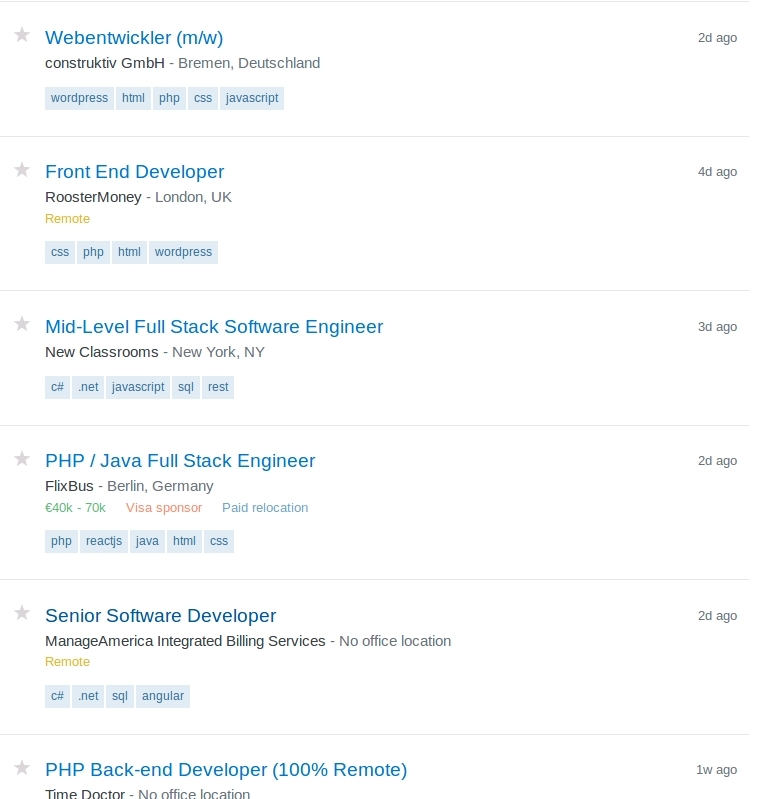 If we take a look at the listing above, we see only Senior Software Developer as an opened link, but I opened several other links as well. Sidenote, only slightly related to the question: It would be very useful for me to mark companies which are not interesting for me. For example, if I read the job listing of a company and realize during that that I will not really be interested to read other possible listings for that company, it would be extremely helpful to mark it. As things are standing, I need to take manual notes for each company or listing at a separate file, which solves the problem, but this feature does not seem to be very difficult. Abstractly, a new table for viewed listings with a foreign key to the user table and another table for blacklist of companies, having a foreign key to the user table, along with some very simple changes on the UI (CSS classes for the listings which are either blacklisted companies or viewed listings) would do the trick. A life cycle of a month for such records would more-or-less suffice in my opinion.